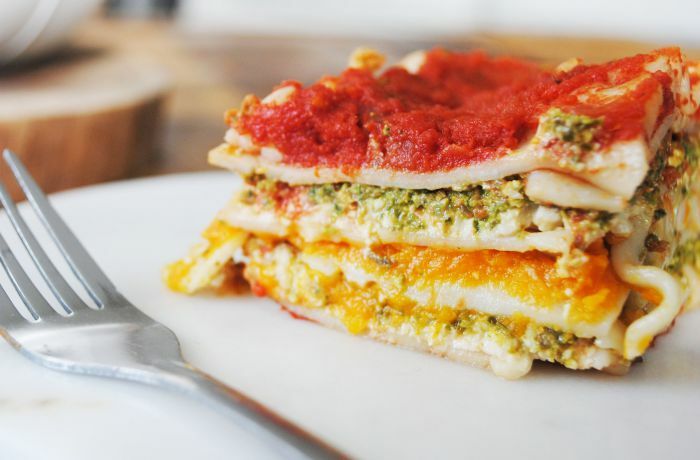 On New Year's Day my sister Sarah made a cashew cream and pesto lasagna from the vegan chickpea, which was out of this world delicious and what this recipe I'm sharing with you now is based off of. Everyone at the table, from the vegetarians to the eager meat-eaters alike, loved it, and I knew I wanted to make my own version of it as soon as I got home. This recipe is hearty, substantial and the perfect cold weather comfort dish. I modified the pesto and cashew cream sauces slightly, then added a layer of butternut squash for some sweetness and extra fiber. This recipe isn't difficult, but it takes some time to make the different sauces. After that, all you have to do is layer them between your lasagna noodles. I like to use gluten-free ones, but regular noodles can be substituted too. 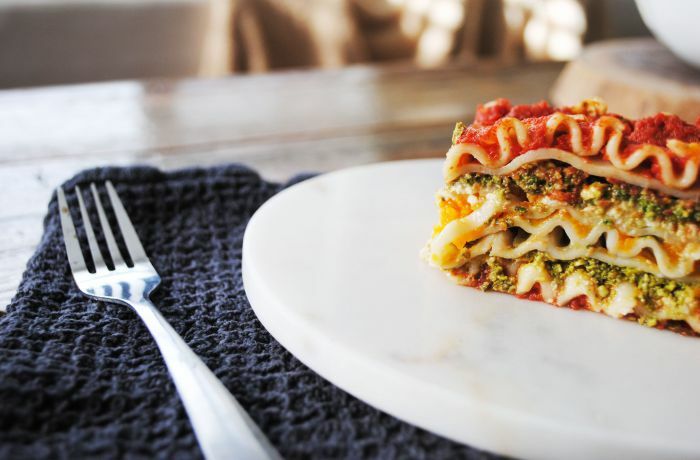 This lasagna not only has less saturated fat than your typical meat and cheese heavy versions, it also has more vitamins and minerals because of the extra dose of veggies. 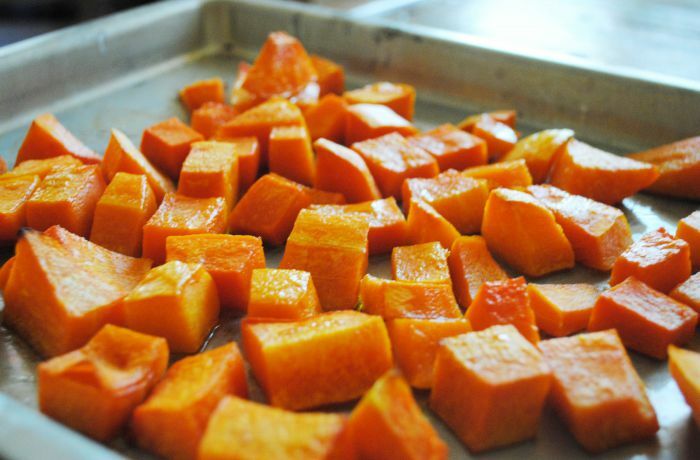 Winter squash is packed with cancer-fighting carotenoids and tomatoes are known for containing lycopene which improves eyesight. Basil has been proven to boost memory function and calm the nerves, and cashews add a nice protein boost. While this isn't a fat free recipe, cashews are lower in fat than most other nuts and also contain magnesium, iron, potassium and zinc. 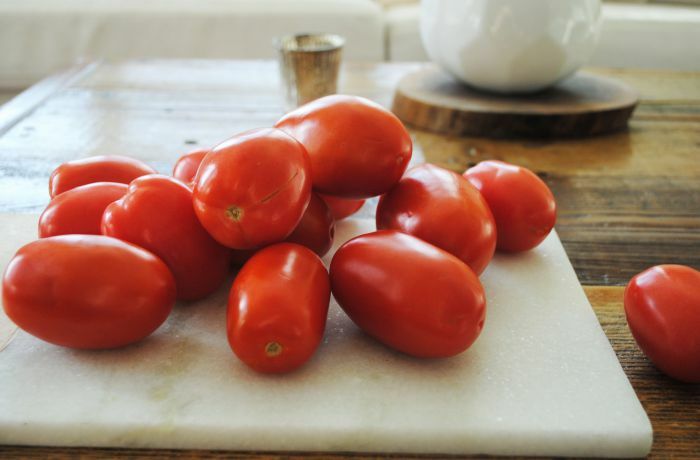 If you're trying to save time you can use a store-bought tomato sauce, but I just love this one my sister taught me. This makes between 6-10 servings (depending on how hungry you are) but if you're cooking for 1 or 2 this freezes really well too. Once sauces below are prepared, pre-cook lasagna noodles based on package instructions. Spread a thin layer of tomato sauce on the bottom of a 13 x 8 inch lasagna pan. Cover with three noodles, then spread half of the cashew cream mixture on top of the noodles using the back of a spoon. Top with another layer of tomato sauce, followed by half of the pesto. Top with three noodles and the entire butternut squash mixture. Cover with three more noodles, and repeat the cashew cream, tomato sauce and pesto layer. Finish with your final three noodles and a final layer of tomato sauce. Cover with aluminum foil and place in the oven to cook for 30 minutes. Let cool slightly before serving. Heat oil in a large saucepan over medium heat. Add onions and saute until translucent and soft, about 5 minutes. Add garlic and saute for another 2 minutes. Stir in remaining ingredients and add additional salt and pepper to taste as required. Let simmer for 30 minutes or until you're ready to assemble your lasagna. 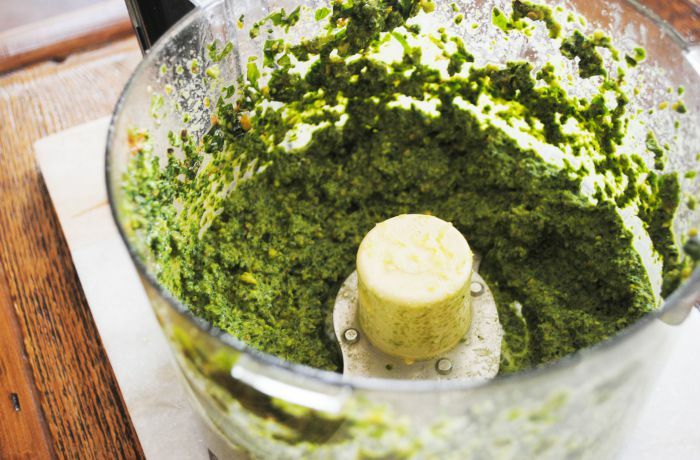 Combine all ingredients in a food processor and blend until smooth. Transfer to a bowl and set aside. Combine all ingredients in a high speed blender such as a vitamix, transfer to a bowl and set aside. Wow! This recipes sounds amazing! making it tonight! Love this! 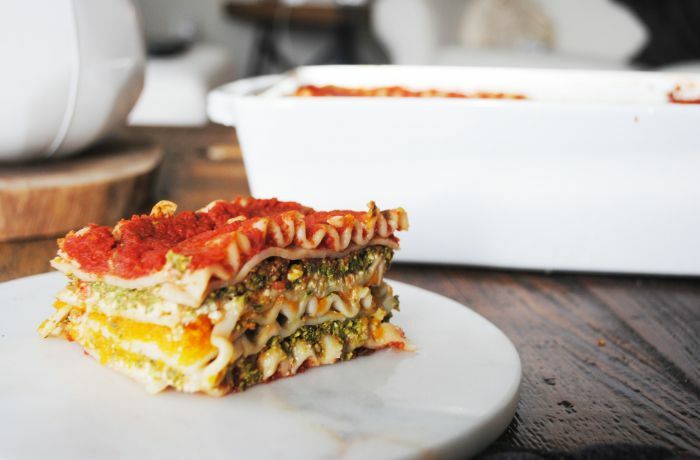 We had this lasagna for dinner tonight and were so pleased with the recipe. It was flavorful, moist and really filling. The lasagna was a love for vegetarians and meat lovers alike! The recipe was a little time consuming to make from scratch but I would happily make it for a special occasion!